From 2015 WNBA MVP, 2016 Olympic gold medalist, and global ambassador to the Special Olympics Elena Delle Donne comes the first novel in a brand-new middle grade series with as much heart as there is game. Elle Deluca is a seventh grader who is tall—not just sort of tall. She’s six feet tall. And for a twelve-year-old girl, this means that her basketball team has high hopes for her changing positions and becoming their starting center. But a new position is not the only footwork she has to learn. Her class’s dance unit in gym is coming up, and that means she has to learn ballroom dance steps with a boy much shorter than her—and perform publically for a grade. In the first book in WNBA MVP and Olympic gold medalist Elena Delle Donne’s Hoops series, Elle must figure out a way to remain herself when others want her to be someone else. My Height Is Ruining My Life! People had been asking me that question ever since third grade, when I was so tall that I looked like I belonged in sixth grade. It used to annoy me. Just because I was tall, I was supposed to like basketball? And automatically be good at it? It didn’t seem fair. I was tall, so I was destined to play basketball, whether I liked it or not. So I guess it’s good that I actually ended up liking basketball. That’s because of my brother, Jim. He’s five years older than I am, and he’s really into sports. In our house there was always some kind of game on TV, and so I grew up watching Michael Jordan in the NBA and Sheryl Swoopes in the WNBA. We also had a basketball hoop in our driveway, so Jim taught me how to shoot, and when I got good at it we’d play against each other. When I was in fifth grade, I joined the basketball team at school, and I’d been playing ever since. I’d been growing ever since, too. By the summer I was twelve years old, I’d shot up to six feet tall. That’s right. Six feet. In seventh grade, most people are around five feet tall. That made me taller than every single kid in my grade, including the boys, and I was even taller than some of my teachers! I could barely fit in any of the desks in any classroom, so my knees were constantly banging into the bottom of my desk. And since I’d shot up a few inches in just a few months, I felt like I was in some alien body. My legs and arms just wanted to do things all on their own. There was only one good thing about constantly growing. It meant I had to keep buying new basketball shoes—and while I didn’t care much about fashion, I was totally obsessed with basketball shoes. My newest pair had a herringbone pattern on the outsole for extra traction, a padded heel, and a lime green stripe and laces, which perfectly matched my green and yellow basketball uniform. I was lacing up my new shoes in the locker room on the first day of basketball practice when my best friend, Avery, noticed them. We both moved to the mirror, where I pulled my long blond hair back into a ponytail. Avery’s hair was normally curly, but for basketball season she wore it in tight braids that went along the side of her head and hung down her back. The summer had turned me into a tall, gangly, pale beanpole (Mom’s a sunscreen freak), but Avery had come back to school looking gorgeous, with contacts in her big brown eyes and a glowing tone to her brown skin. We looked so different that you might not believe we were best friends, but we had been since first grade, when we bonded over a mutual love of pizza and the Powerpuff Girls. “Yeah, I’m just a little nervous, I guess,” I replied. “I guess,” I said, letting out an anxious breath. We headed out to the school gym. Spring Meadow School was a small private school in Wilmington, Delaware. It was a K–12 school with only about fifty kids in each grade. So it was pretty amazing that we had ten girls interested in being on the basketball team. I had been playing with most of the girls since fifth grade. Hannah Chambal and Natalie Saunders were best friends, and they were also both really nice. Caroline Lindgren was nice too, but she was one of our weaker players and spent most of her time on the bench. Bianca Hidalgo, Tiff Kalifeh, and Dina Garcia were all pretty tight with one another, and they were all good players. Patrice Ramirez was the daughter of our coach. The only girl I hadn’t played with yet was Amanda O’Connor. I’d heard that Coach Ramirez had convinced her to join the team this year, after Molly Porter moved away. Amanda was on the shorter side, and I didn’t think she was sporty. She came to Spring Meadow a year ago, and she joined the choir and I think the school band, too. So I was a little curious to see what kind of an athlete she was. We all started stretching to warm up, dressed in our practice uniforms: green shorts with a yellow stripe down the side, and green T-shirts with “Nighthawks” in yellow letters across the front, and a yellow bird on the back. Coach Ramirez came out of her office and strolled onto the gym. She coached the middle school teams for Spring Meadow. For fifth and sixth grade, we’d been coached by Coach Friedman, a sixth-grade math teacher. He was so quiet that his nickname was “Coach Mouse.” So I wondered what Coach Ramirez was like. The first thing I learned was that she was not quiet at all. We scrambled onto the gym floor. She had that kind of voice that made you hustle when she told you to do something. I ended up in the last row with Avery on my right and Amanda on my left. “Give me ten squats!” Coach Ramirez ordered. I dropped and started the warm-up. It felt good to be moving, and I could feel my nerves dropping away. We followed the squats with some old-school push-ups, sit-ups, and jumping jacks. I glanced over at Amanda to see how she was doing. She had her reddish-brown hair pulled back in a messy ponytail, and her freckled cheeks were turning pink, but she was keeping up with everyone else. Bianca raised her hand. “Why can’t we play the same positions we played last year?” she asked. I could feel my own cheeks getting pink. Now everyone was expecting me to be great—just because I had suddenly become supersized. A “monster,” Coach had called me. Nice. Coach Ramirez pointed to the end of the court nearest her. A bunch of orange cones had been lined up on the end line, behind the basket. Following her instructions, we formed two lines, one on each side of the free throw line. Avery, me, Amanda, Caroline, and Patrice stood on the left side. Tiff, Bianca, Dina, Hannah, and Natalie lined up on the right. Coach Ramirez tossed a basketball to Avery and one to Tiff. “Yes, Coach!” we all replied. I stretched my arms, ready for action. Now that competition was in the mix, I was more eager than ever to do a good job. Coach Ramirez put the whistle to her mouth. Avery and Tiff shot for the basket at the same time. Avery’s bounced off the rim. Tiff’s swished through the net. She ran to grab a cone, grinning confidently. But then again, Tiff was always super confident. She worked out all the time, got straight As, and she even designed and sewed her own hijabs. She wore a green and yellow one to match the Nighthawks uniform at every game and practice. It was my turn to shoot next, along with Bianca. Swish! Swish! We both made our shots. I ran across the court to grab a cone—and ended up knocking over two cones when I picked up mine. “Deluca, fix those!” Coach called out to me. I did it and quickly ran back to the line. Amanda had made her basket and ran past me, smiling. Caroline shot next for our team, and she missed. So did Patrice. “Line up the ball with your shooting eye next time, Ramirez!” Coach yelled at her daughter. Patrice bit her lip and moved to the back of the line. I looked over at the other team. They had grabbed five cones already, and we only had a measly two. But then we quickly caught up. Avery made her shot, and I sank the ball on my next turn. I didn’t knock over any cones this time, either. Nope. Instead, I stumbled on my run back and had to stop myself from falling on my face. I looked to see if Coach Ramirez was watching. Of course she was, but she didn’t say anything about it, thankfully. The drill moved pretty quickly. Soon we had eight cones to the other team’s ten. Patrice didn’t miss a basket after that first one, and even Caroline managed to get one in. I only missed one. My last shot bounced off the backboard and through the hoop. I ran back to get a cone—except there were none left. Instead, Bianca ran past me, triumphantly holding up the last cone. “We win!” she cheered, and she and the other girls on her team started jumping up and down. We quickly stacked the cones on the sidelines and then Coach explained the next drill to us. Two players would be on the court at a time—one playing offense, the other playing defense. The offensive player would have a few feet head start. On the whistle, the offensive player would dribble down the court and try to do a layup while the defensive player tried to block the shot. Coach blew the whistle, and they both sprinted down the court. Tiff’s pretty fast, so she caught up to Bianca and got in front of her and tried to block the shot, but Bianca jumped up and got the layup pretty easily. Caroline and Amanda went next, with Amanda on defense. Amanda was fast too, but I could tell that she was a little unsure of what to do once she caught up with Caroline. Caroline missed the shot, but not because of Amanda’s pressure—she just came in at a bad angle. Then it was my turn to block Avery. I caught up to her and when I pivoted to move in front of her, I accidentally bumped into her. “No FOULS, Deluca!” Coach Ramirez yelled. “Sorry, Coach!” I said, as Avery’s layup swished through the net. I figured there was no point in making excuses to Coach Ramirez. What would I have said, anyway? Uh, it was an accident because I still haven’t gotten used to how my body works yet. No way. I did better when it came my turn to shoot. Coach had Dina guarding me, which was crazy, because while Dina’s a good player she’s one of the shortest on the team. I made an easy layup—and I didn’t even trip! After everybody had a turn shooting and defending, we did the drill from the other side of the court. That meant we had to dribble and finish with our left hand. I’m pretty comfortable on both sides of the court, so I nailed that shot too—even though Bianca jumped like a kangaroo to try to block me. We did a few more drills after that one, and I was pretty sure I had done okay—not my best, but okay. Coach instructed us to cool down and disappeared into her office. Avery and I sat on the bleachers. Coach Ramirez strolled back out, holding her clipboard. I saw Caroline look down at her feet, and I felt bad for her—we all knew Coach was talking about Caroline. Then it occurred to me that she might have been talking about me, too, and my palms started to sweat. I almost fell off the bleachers. I knew I shouldn’t interrupt Coach, but I couldn’t stop myself. “Me?” I asked. My mind was reeling. Center was maybe the toughest position to play. Besides being expected to stay open for passes, a center had to do a lot of blocking near the net, and be ready to pick up rebounds. The rest of us got really quiet. We hadn’t been working with Coach Ramirez that long, but we already knew that she wasn’t the kind of coach you could challenge. This was a pretty bold move on Bianca’s part. Coach Ramirez lowered her clipboard and looked directly at Bianca. “Yes, Coach,” Bianca replied, but boy, did she look upset. I guess I looked upset too, after hearing Coach’s explanation. Did she make me center because I was the best shot, or the best at offense? No. She gave me the position just because I was tall. That meant I didn’t get to be shooting guard. And Bianca was unhappy, and that wasn’t cool, because Bianca loved drama. I am the opposite. I usually go out of my way to avoid it. I sighed. My height was ruining my life again! If, like Elle, you’re a seventh-grade girl and already six feet tall, everyone notices you. And if, like Elle, you’re pretty good at basketball, everyone’s sure you’ll be a pro someday. But Elle isn’t so sure. Does she love basketball more than anything? What would she do if she didn’t spend so much time on the court? Elle loves being part of a team with so many of her friends, but the coach can be tough and even teammates can be mean. 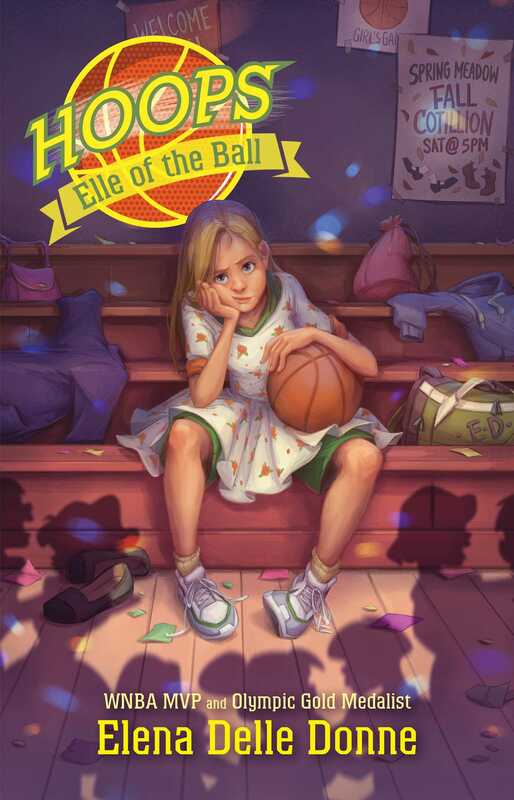 Written by a real-life WNBA star, the first three books in the Hoops series follow Elle as she plays a lot of basketball while also trying to figure out who she is and what she really wants. 1. How does Elle’s height impact her life? Describe the advantages and disadvantages, if any. How does she feel about it? Give examples from all three books. 2. Why does Elle play basketball? Think about both positive and negative aspects, and discuss whether you think she should keep playing. Make sure to give arguments for both sides. 3. If Elle didn’t play basketball, what might she do with her time? Name other activities that she enjoys, or things that she’s good at. What could she pursue in the future if she decides for certain not to remain on the basketball team? 4. Avery and Blake are Elle’s best friends. Describe her relationship to each of them. How do they make Elle’s life better? What conflicts does she have with them, and how are these issues resolved? 5. Elle loves her sister, Beth, very much. Why does she consider Beth to be a positive force in her life? Describe Beth and her role in the family. Find places where Elle discusses Beth with those outside of her family, and analyze what she says. 6. Describe other members of Elle’s family, including her extended family. How do her parents support her athletic activities and other ventures? What role does her brother play in her life? Talk about the pressure her grandparents and uncle put on her to play basketball, and how Elle feels about it. 7. How does Elle first encounter Zobe? How does he end up becoming the family pet? What does he add to the family and to Elle’s life? Discuss why he needs training and what it consists of. How might the training resemble coaching a basketball team? 8. Bianca gives Elle a hard time both on and off the court. What motivates her insults and hostility? How does Elle feel about Bianca’s behavior? When Blake and Bianca start spending time together, how does Elle react and why? Would you have reacted similarly? 9. Tiff is Bianca’s good friend, yet she also stays on good terms with Elle. How would you describe Tiff? How do she and Elle interact? Why can navigating friendships be difficult? 10. What do you learn about hijabs from Tiff and her mother? How does Tiff tie the hijabs into her wardrobe? 11. Being on the team helps Elle make new friends, one of whom is Amanda. Describe what Amanda and Elle have in common, and how you think Elle feels about her. How do you know? Another new friend is Caroline. How does Caroline’s younger brother, Pete, bring Elle and Caroline closer together? 12. The coach has the most criticism for her daughter, Patrice, and Elle. Analyze why she might be so hard on both of them. Do you think the negative focus of her comments is helpful? What else could she do to motivate those two players? 13. In Elle of the Ball, Elle is frustrated about the cotillion. Describe the cotillion and Elle’s reaction to different aspects of it. What are her objections to the dance and the preparation for it? How does she influence future changes in the cotillion? Have you ever objected to the way something was handled and worked to make it better in the future? 14. Elle’s mother always says, “‘You can’t control what people say or think about you. You can only control how you react to that. You can only control who you are.’” Discuss her statement and how Elle tries to apply it to her life. How do you think you might use that advice in your own life? 15. In Full-Court Press, Elle struggles with time management. What are some of the activities that she wants to do or has to do? What goes wrong when she doesn’t manage her time well? Explain what helps her start to get better at it. What advice would you have given her? 16. Describe Elle’s home, school, neighborhood, and town. What advantages does she have that a lot of kids don’t have? How do those advantages make a difference in her life and help her succeed? Does Elle understand the impact of these advantages? Do you think they put more pressure on her? How might she help other kids who don’t have the same advantages she has? 17. Elle tells her own story in a first-person narrative format. Why do you think the author made this choice? How might the story have changed if it had been written in third person? Did it make a difference to you as a reader that the author is a WNBA star? Explain your answer. 18. Why do you think schools have sports teams? Do you think sports teams have educational value? What might they teach you? Do you think they improve students’ lives? Explain your reasoning. List some reasons why different girls have chosen to play on Elle’s team. Have students work in pairs to research therapy dogs and other therapy animals. After their initial research, students should narrow their focus to a particular type of therapy animal and the animal’s work. What does the animal do? How does it interact with humans? How is it trained? Have the students organize the information onto a poster to display in the classroom. Hold a class discussion about the different therapy animals and their work. After thinking about Coach Ramirez, each student should write an advertisement for a middle school basketball coach. The ad should lay out the qualities that the student thinks are most important in a successful coach, and the kind of background they think would be helpful. Ask them to think about the potential coach’s education, athletic experience, work experience, and so on. Have students type up their ads and meet in small groups to compare what each person thought was most important. Elle, who has her own pregame routine, has also researched the pregame routines of WNBA players. Have students do similar research on the preperformance routines of athletes in different sports or of musicians, actors, public speakers, comedians, or even surgeons. Students should take notes on their research to bring to a classroom discussion about what they learned, why performers have such routines, and whether or not they think the routines help. 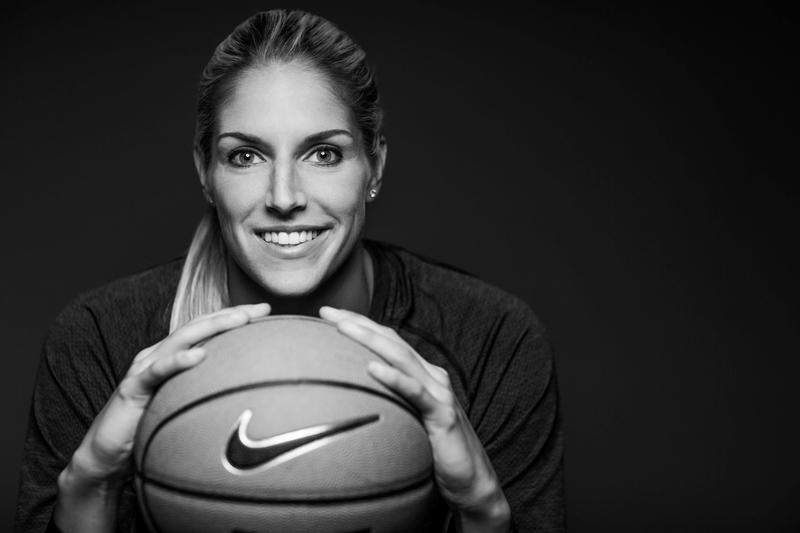 Author Elena Delle Donne is a highly successful basketball player in the WNBA. Have each student choose a different WNBA player to learn more about. They should find professional facts about the player, interesting details about her background, and career highlights. Then they can create a multimedia presentation about the player to share with the class. Have the class discuss the similarities and differences between these women’s paths to the WNBA and imagine what life might have been like for them when they were in elementary and middle school. Volunteering at Camp Cooperation is a highlight of Elle’s year. What other volunteer activities can kids do? Have students draw from their own experiences to compile a list of ideas. Then have a class discussion about the benefits of volunteering both from the volunteer’s perspective and for the community or recipient. Like Elle, many students struggle with time management. Have students jot down notes about what Elle does to improve her scheduling. Then have them ask adults and older students they know for tips on time management. Working in small groups, students should prepare and distribute a Time Tips brochure based on what they learned. Find templates by searching for the keyword “brochure” at www.readwritethink.org. Guide written by Kathleen Odean, a youth librarian for seventeen years who chaired the 2002 Newbery Award Committee. She now gives all-day workshops on new books for children and teens. She tweets at @kathleenodean. Elena Delle Donne has been a professional women’s basketball player since 2013, when she was selected by the Chicago Sky second overall in the WNBA draft. She was the 2015 WNBA MVP and won the gold medal with the USA’s women’s basketball team in the 2016 Olympics. She is the global ambassador for the Special Olympics and became the first national ambassador for the Lyme Research Alliance. Elena also plays host to De11e Donne Academy, a basketball camp that runs throughout the year, where she mentors and coaches girls ages seven to eighteen. She now plays for the Washington, DC, Mystics.